Images of the gently refreshed 2014 BMW M5 were accidentally posted on the company website recently and while those images were quickly removed, they were saved and reposted by Autocar – giving us a look at the new front end and interior while also suggesting a possible increase in performance. 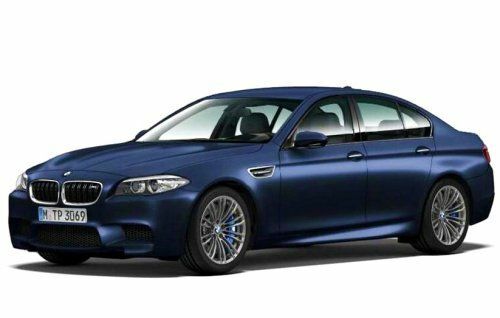 The BMW M5 is only a couple years old but based on the images that the German automaker accidentally posted on the configuration page for the high performance sedan, it appears as though the M5 will be lightly refreshed for the 2014 model year. While the exterior appears to be largely unchanged based on a quick look, a longer examination reveals a new headlight design and an even more gently revised grille area. The headlights of the 2014 M5 appear to have a very similar layout to the 2013 models with projection assemblies joined by a row of LEDs but the 2014 headlights appear to have a slightly more aggressive look – almost like this new M5 is even angrier than the previous model. The dual kidney grille is the same basic shape but the spokes filling these two openings have thicker dual bars running top to bottom (similar to what is featured on the M6) as opposed to the thinner, single bars in the grille of the 2013 M5. On the inside, the 2014 BMW M5 will feature a new steering wheel design that is also borrowed from the BMW M6 along with a touch sensitive iDrive system controller. Beyond that, any interior changes may not be clear until the company issues the full information on the new super sedan but the most exciting bit of anticipated information on the 2014 M5 is even more power than the 2013 M5. The 2014 BMW M5 will be powered by the same 4.4L twin turbocharged V8 with 552 horsepower but Autocar reports that BMW will offer a new Competition Package for the 2014 M5 that increases output to 567 horsepower. In addition to the increase in power, the 2014 M5 fitted with the Competition Package will also wear a unique set of wheels and a stiffer suspension system along with a revised M Dynamic drive mode. This optional package should improve the 2014 BMW M5 in just about every way – from acceleration to handling to the simple fun to drive factor thanks to the revised dynamic drive mode. Must have feature? I think so. There is also no idea on how much the new Competition Package will cost but if you are going to drop 92 large on a high performance sedan, even an extra couple grand immaterial when you consider the features of that package. Since there hasn’t been any official word from BMW on the 2014 M5 sport luxury sedan, it is unclear how much the new model year will cost but we would expect it to be in the same range although possibly a touch higher than the $92,425 price (including gas guzzler tax and destination) of the 2013 M5. The 2014 M5 is expected to hit the market later this year so it shouldn’t be too long before we get the full details with official images from the German automaker.